Felines are active and efficient breeders. The fact that cats can be pregnant when they are as young as four months and can produce at least three liters per year is startling. In numbers, a cat can give birth to around 180 kittens in her lifetime. These statistics makes sense when you consider the number of young kittens that are euthanized per year due to the constraints in re-homing them. These can be certain compelling pointers for feline owners to desex their cat. If these are not compelling enough, read on to learn more about the benefits of cat desexing. Behavioral control: during the season or when your cat is in heat, she is exhibits some unusual or anti social behavior. She will be agitated and often show the interest in getting out. This is something that will provide her with an opportunity to meet other male companions. In the case of males, they are most likely to end up in brawls with other counterparts over female cats. This can lead to ruptured eyeballs and other serious wounds. If your cat is desexed, he or she will show a reduced tendency to roam around during the season. The process can also help you to alleviate the concerns like spraying associated with males and howling with females. Prevents unwanted litters: unwanted litters can be a headache. As mentioned earlier, thousands of cats are abandoned and euthanatized every year. Getting rid of the kittens that your cat leaves behind can also be a hard task. This is where desexing can be a godsend. Cost savings: taking care of a pregnant cat and her kittens can be expensive. You never know what can go wrong; you might have to spend a lot if there are any complications. Other cost involved can be working, veterinary checkups and diet. Increased lifespan and quality life: as per the statistics, desexing can improve the lifespan of your cat. The process alleviates the concern of ovarian, mammary and testicular cancer in addition to other sexually communicable diseases. The process can also provide your female feline with relief from stress and strain that they experience during the season, making them happier and calm. 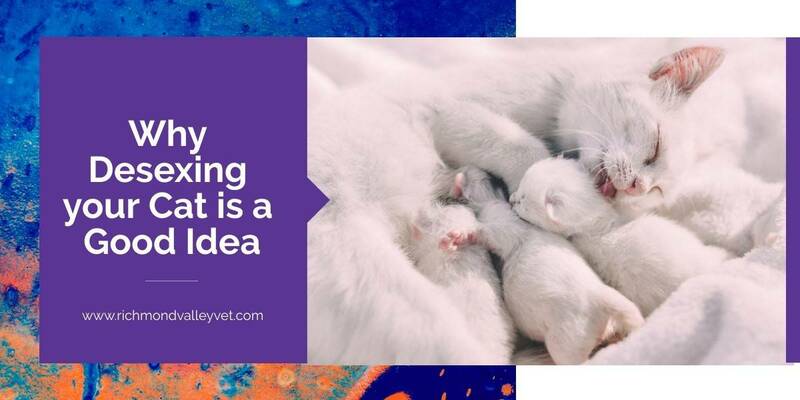 As desexing can make cats calmer, it can prevent issues like a fight over territory or mating partners, reduce the injuries like car trauma, abscesses and other infections can occur from wounds. The process of desexing can be different for both males and female felines. The procedure is conducted under full anesthetic and the downtime can be more for females compared to males. The desexing procedure is fairly simple in male cats as compared to females, which also require more time. Consult with a veterinarian and consider all the options prior to desexing your cat.